Bigger is better! Mercedes-Benz supplements the smart fleet of Car2Go with luxury sedans and crossovers. The CLA and the GLA will be among the cars provided to their 2.2 million customers worldwide. The almost 10-year old subsidiary of Daimler is performing an upgrade to its car sharing fleet. The car sharing service has just announced it will be expanding its offer that now include the CLA 4-door coupe as well as the GLA crossover. 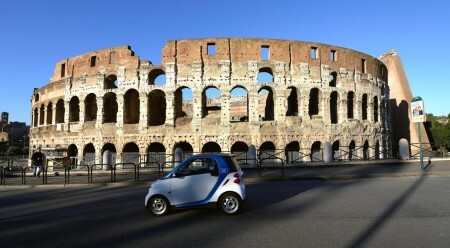 This comes after the company has based its activity on the tiniest cars on the market, the two-seat smart. The target, by the end of 2017, is for Car2Go to have more four-seaters than smart vehicles in its fleet. The sedans and the crossovers are already on their way to six North American metropolitan areas. The residents and tourists of Austin, Portland, Seattle, Toronto, Vancouver and Washington will be the first to benefit from the upgrade. The company makes this move in order to attract customers who don’t exactly fit the size of a microcar and who actually have some luggage to transport in their trunks. As the popularity of the car sharing has grown throughout the years, so have the demands of the customers. Therefore, Daimler’s Car2Go, born in 2008, is not the only luxury company that started its own car sharing business. BMW owns the ReachNow service. Apparently, such services seem to change lives, according to the company’s president Paul DeLong. “A lot of people back when we first started, they were single people, they didn’t have families, they owned a car and they decided to get rid of a car because of car-sharing services like Car2Go. As their life has gotten bigger and people have entered into their life, having a bigger vehicle matters”, DeLong says.